Just about everyone views the National Rifle Association as the leading champion of gun culture in the United States. When there is a mass shooting — even one as outrageous as the attack at Sandy Hook Elementary — we have learned to expect the NRA to uncompromisingly oppose any government response that would limit the rights of gun owners. Schools, on the other hand, are viewed as the daytime guardians of our children and are expected to have an equally uncompromising stance against weapons and violence. Zero-tolerance policies commonly allow for the expulsion of a child just for bringing a toy resembling a weapon to school, and students are typically barraged at school with messages against joining gangs and using violence to resolve conflict. Surely it would be inconsistent, then, if schools were to sponsor programs designed to acclimate kids to violence; and we certainly wouldn't expect them to be actively teaching students the skills needed to become shooters. That would be incredibly absurd, right? Unfortunately, that is exactly what is happening in a large number of our high schools, where local school districts and the Pentagon are co-sponsoring Junior ROTC marksmanship training. Think about it: a child can be disciplined for bringing a squirt gun to class, but school officials and the Pentagon get a pass when they train students to use rifles with shooting ranges inside our schools. And despite the dangerous implications of giving such a mixed message about guns to young people, this program receives little or no critical attention from the media, politicians or gun control groups who are protesting school shootings and societal violence. For those of haven't heard, there are now approximately 3,400 secondary schools with units of the Junior Reserve Officer Training Corps, a military training and recruiting program open to students as young as age 14. Founded in 1916, it is operated jointly by the host schools and individual military branches. Instructors are retired officers employed by the local school district. Over half a million students are enrolled in the program and attend daily classes that teach them military customs and demeanor. They are assigned ranks, required to wear uniforms at least once a week, learn to march, and study history, civics and other subjects from Pentagon-supplied textbooks. Students are graded according to how well they can demonstrate that they have internalized military behavior, values and culture. Unlike college ROTC, there is no military obligation with JROTC; however, according to testimony in Congress, 30%-40% of JROTC cadets eventually join the military. Schools receive a limited federal subsidy to help cover the salaries of JROTC instructors, but a very high instructor-to-student ratio mandated by the Pentagon produces a net cost that is a drain on local school funds. Marksmanship training is an optional component of JROTC and is used as a magnet to boost student enrollment in the program. The size of enrollment is important because federal law states that JROTC units cannot be maintained at a school unless the number of cadets totals at least 100 or 10% of the student body. The non-governmental Civilian Marksmanship Program, which promotes youth involvement with guns and collaborates with JROTC, once published an article stating that at least two-thirds of all JROTC units include marksmanship training (http://www.odcmp.org/0305/JMIC.asp). If true, it means it exists in over 2200 high schools. Doubts about the JROTC marksmanship program have not been totally absent. Originally, students were trained with either .22 caliber rifles or compressed-air rifles that fired lead pellets. Sometime in the last 10-15 years, the Pentagon made a decision to phase out the .22s in favor of using only pellet rifles. It seems likely this was because of the perceived possibility of a future public relations problem. That fear might have been fed in 1999 when the superintendent of Chicago Public Schools, home of the country's largest JROTC program, responded to the Columbine school shooting by acting administratively to ban all marksmanship training in the district. The issue became a major focus of debate in the San Diego Unified School District in 2007, when teachers and students discovered plans to install JROTC shooting ranges at two high schools. Local research soon revealed that shooting ranges had existed for years at other schools in the district, and if the new ones were added to the total, there would be shooting ranges in 11 of the 13 schools with JROTC in San Diego. Knowledge of these facts provoked an intense campaign of protest that was unusual for such a location. San Diego County hosts one of the largest military complexes in the world, with over 110,000 active duty personnel and a Department of Defense payroll that is often number one in the nation. It is not a place where one would expect elected officials to take a stand against anything military. 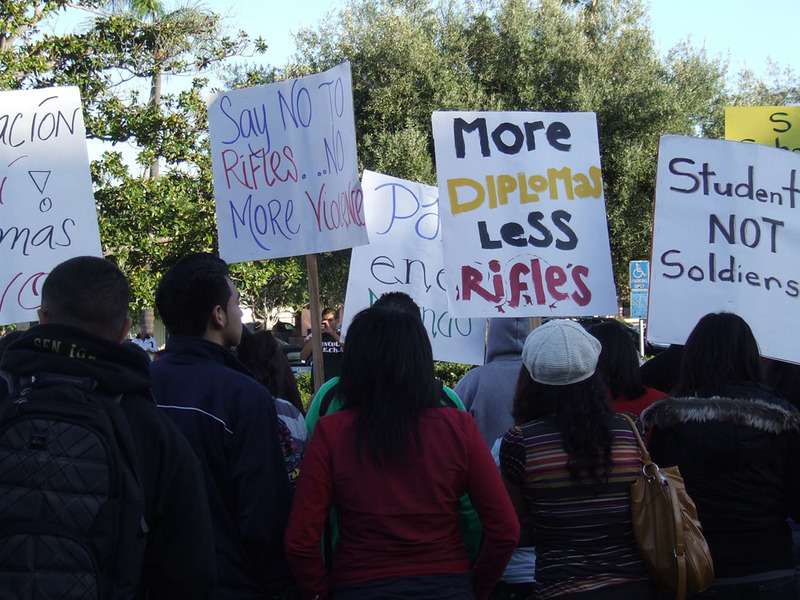 However, that did not discourage a coalition of students, parents, teachers and community activists from approaching the San Diego school board with the following set of demands: enact a ban on all school shooting ranges, stop the involuntary placement of students in JROTC, and stop the practice of using false claims about college eligibility to recruit for JROTC. "NOW, THEREFORE, BE IT RESOLVED, that any existing school district property used for shooting ranges shall be immediately closed for that purpose and converted for other educational uses by the beginning of the next regular school year. "BE IT FURTHER RESOLVED, that marksmanship training, whether it is conducted on-campus or off-campus, and through textbooks or physical instruction, shall not be taught in connection with the San Diego Unified School District and shall be discontinued immediately." A major factor in the coalition's success was the mobilization of students to attend school board meetings. Motivating them was the perception that JROTC was disproportionately recruiting students from working-class families and communities of color, while simultaneously denying them equal access to courses needed to get into college. In addition, there was the strong feeling that placing shooting ranges in their schools was an act of insensitivity toward communities that were struggling to reduce violence rooted in poverty and political neglect. With these and other points, the students and parents who testified at board meetings won over the majority of San Diego school trustees. Defenders of marksmanship training argued that it was just another sport, and linked it to learning leadership skills in JROTC. The sports argument lost its effectiveness in the context of local news of recent student deaths from off-campus gun violence. And the leadership issue was made moot by the fact that the campaign deliberately chose not to demand the removal of JROTC itself, a broader goal that has been impossible to achieve through protest, even in fervently anti-war communities like San Francisco. 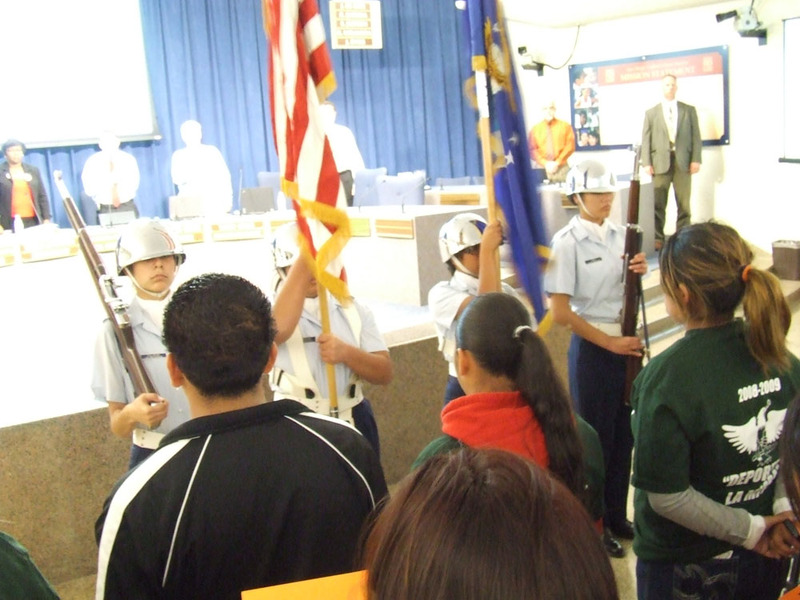 Instead, the San Diego coalition focused more narrowly on aspects of the program that were particularly egregious and served to bolster enrollment in JROTC. 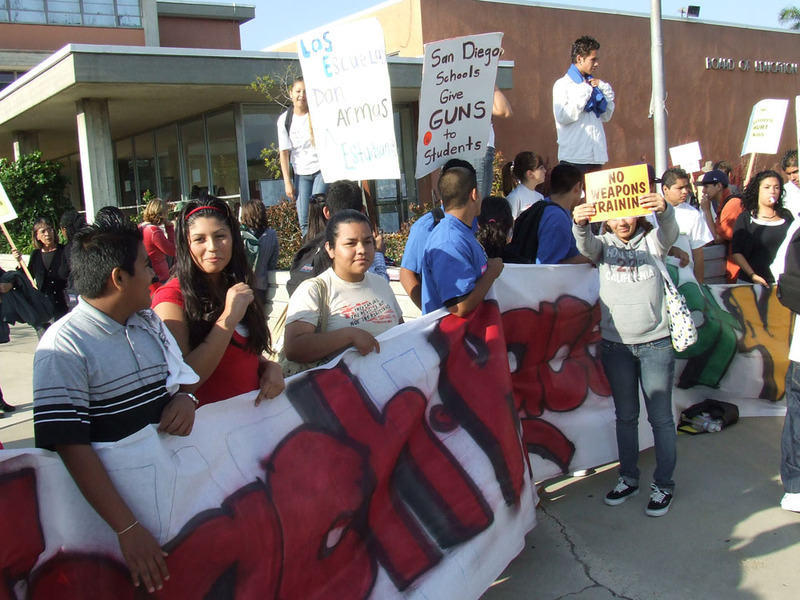 In relation to the enrollment issue, an additional victory was won by students at one of the San Diego schools that had been slated for a new shooting range. The effect of the campaign and peer pressure led to such a low enrollment in the school's Marine Corps JROTC unit that it was eventually forced to leave the campus. Removing shooting ranges from schools does not, of course, address the general problem of militaristic programs in the educational system. JROTC can still have an influence on students without marksmanship training, and there are hundreds of middle and elementary schools that are opening their doors to programs like the Young Marines and the Navy's Starbase. All of these serve to popularize a warrior mentality and ultimately acclimate children to violence. Dealing with these influences in the school system is a long-term challenge that deserves our persistent attention. In the meantime, however, school shooting ranges send a remarkably bad mixed message to students about guns and violence and are something we should feel compelled to protest. Not only can the issue can be won, but by raising it we can also stimulate critical thinking about why we even have militaristic programs in our civilian school system. 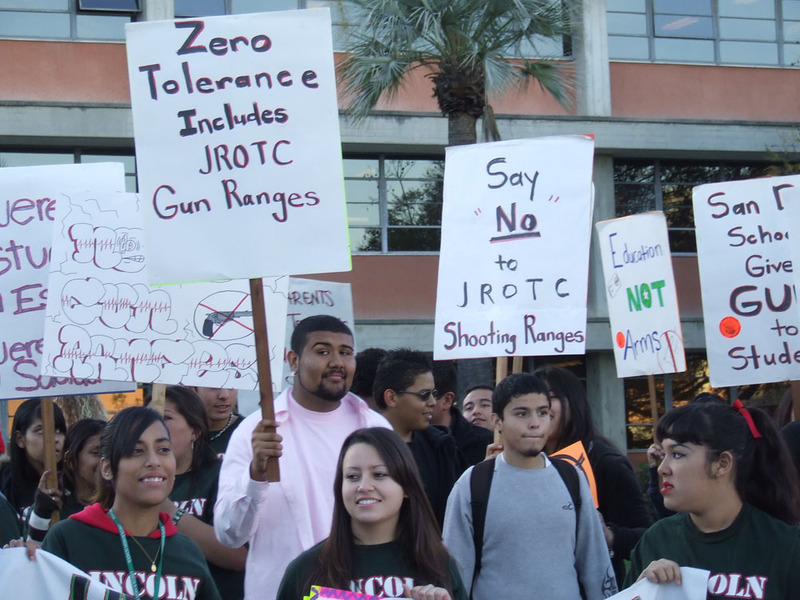 For educational materials and resources on the issue of JROTC and shooting ranges, visit the Education Not Arms Coalition. As a student during the Vietnam War, Rick Jahnkow organized with vets protesting the Vietnam War in San Diego County. Since 1984, he has been the program coordinator for the Project on Youth and Non-Military Opportunities and is on the steering committee of the National Network Opposing the Militarization of Youth.